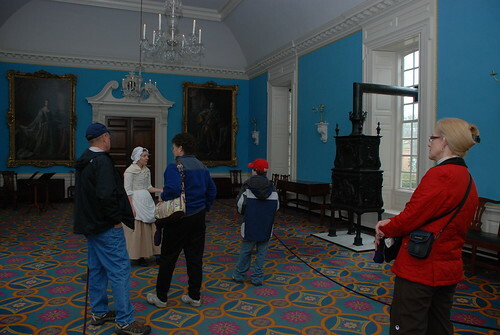 Construction for the Governor's Palace was authorized in 1706. The Palace was complete in 1722. It was home to 5 Royal Lt. Governors and two Royal Governors. Usually , Royal Governors would appoint their Lt. Governors to administer the colony...because they didn't want to leave the comfort of England. When the colonists started acting up, the King required that his appointed Governor move to the Colony and administer it in person. 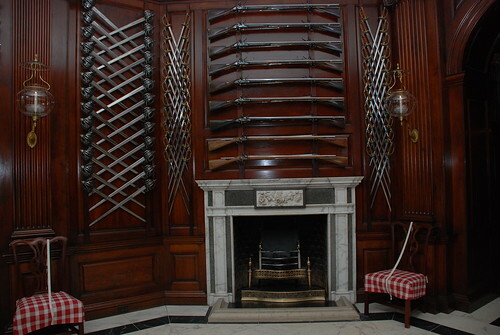 The Palace was destroyed by fire in 1781 while being used as a hospital for American's wounded at Yorktown. It was rebuilt on its orginal foundations in 1930. 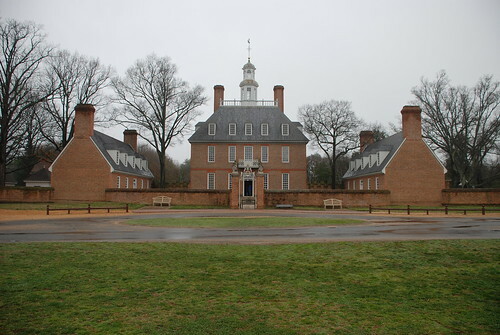 It is furnished to represent the home of the last British Royal Governer of Virginia, John Murray, Fourth Earl of Dunmore. Inside the front entrace of the Palace. According to the tour guide. 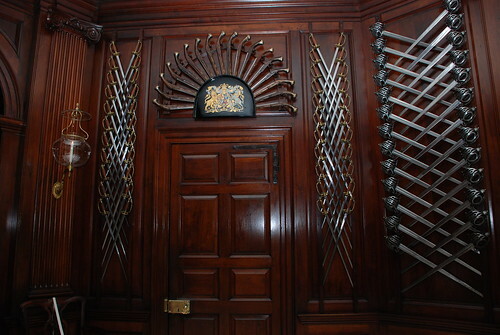 If you were a colonist, the guns and swords hanging on the wall would not have impressed you...because you probably had at least one gun if not more. What would have impressed a colonist....the marble floor. Most colonists were lucky if they had a wooden floor, most had packed and hardened dirt floors in their homes. 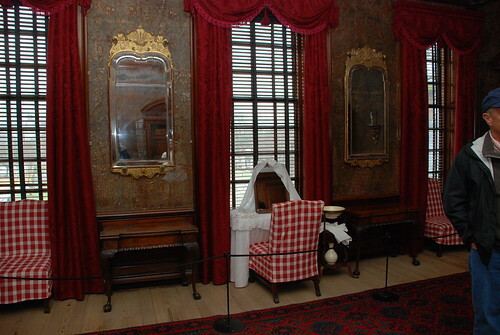 Upstairs, this was the Governor's dressing room. It walls were covered in embossed leather. Below, the family dining room. 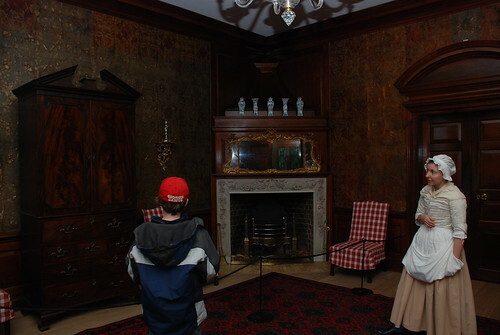 Interestingly, the children would not have taken meals here, they would have taken their meals upstairs in their bedroom with their governess. 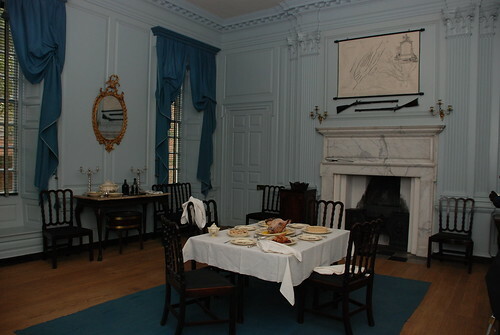 The Governor, his wife and guests would have eaten here. 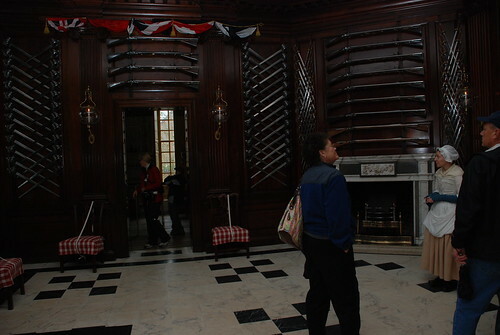 Below, the music room and ball room.